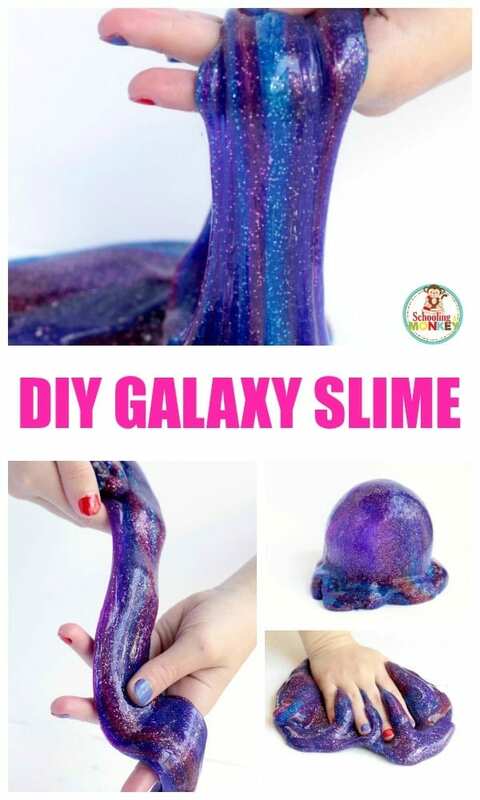 Wondering how to make galaxy slime? 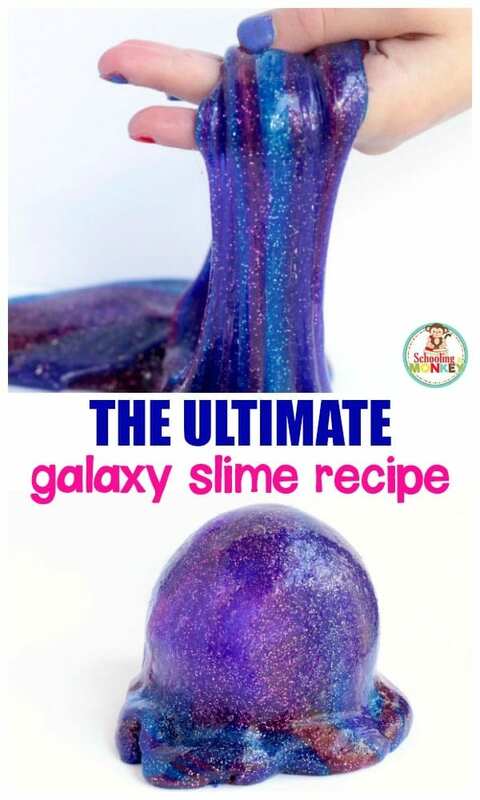 One of the ultimate slime recipes that every person should make at least once (at least I think so) is galaxy slime. 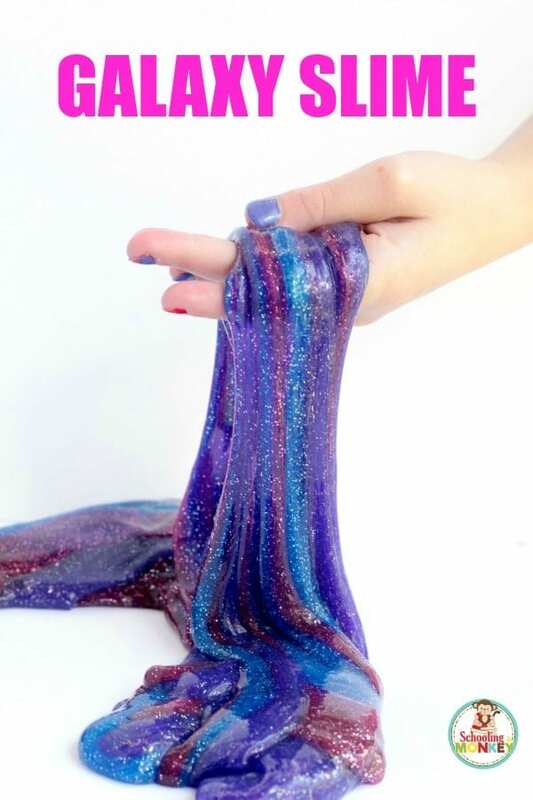 Galaxy slime is so cool because it includes so many swirling colors, glitter, sparkles, and stretchy fun. 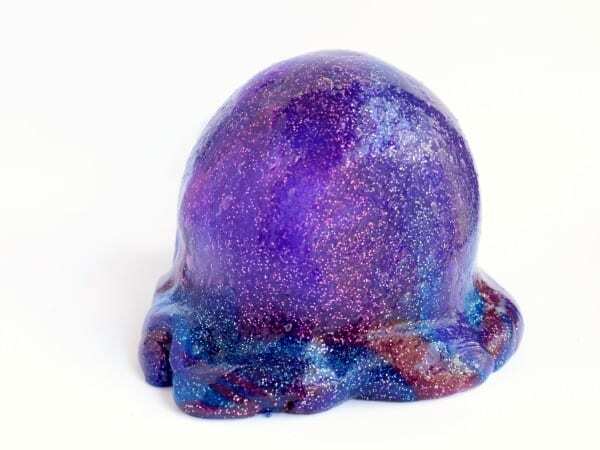 But surprisingly enough, how to make galaxy slime can be a bit tricky. You can’t make galaxy slime from just any slime recipe. The best galaxy slime recipe requires a specific galaxy slime recipe that produces a slime with the exact appearance of NASA photos from space. It’s so much fun to hold a literal galaxy in your hands! This NASA slime is too much fun! My kids LOVE this NASA slime recipe, and today, we’re sharing it with you! 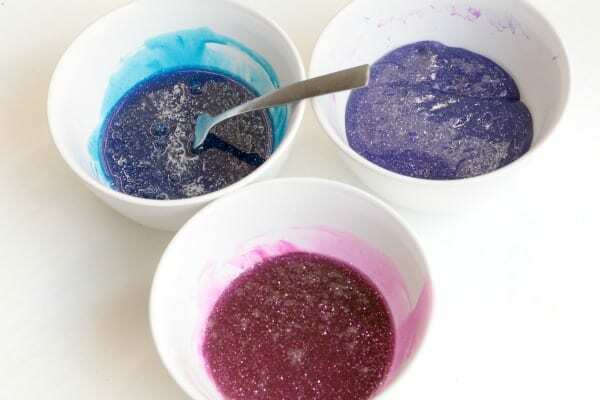 Read on to find out how to make your very own galaxy slime! 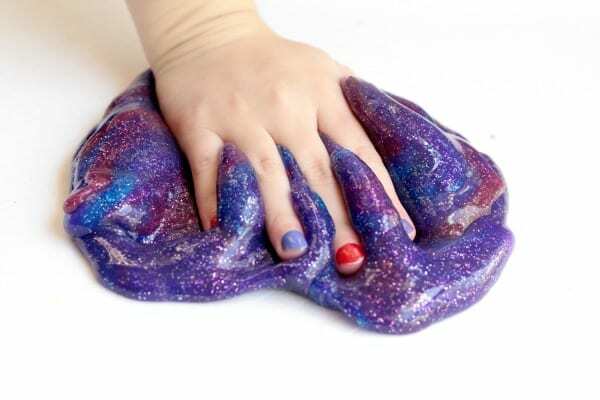 Read on to see how to make the very best slime galaxy! And don’t forget to try our other summer slime recipes: ice cream slime, ocean slime, and sand slime! Slime is made when boron mixes with the polymer chains in the glue, creating strong, but flexible bonds between the molecules. The chemicals in the activator (commonly, boron) cause the molecules to bond into polymer chains, but the molecule chains remain flexible. Other materials that are made of polymer chains include flexible plastic, and even DNA strands! 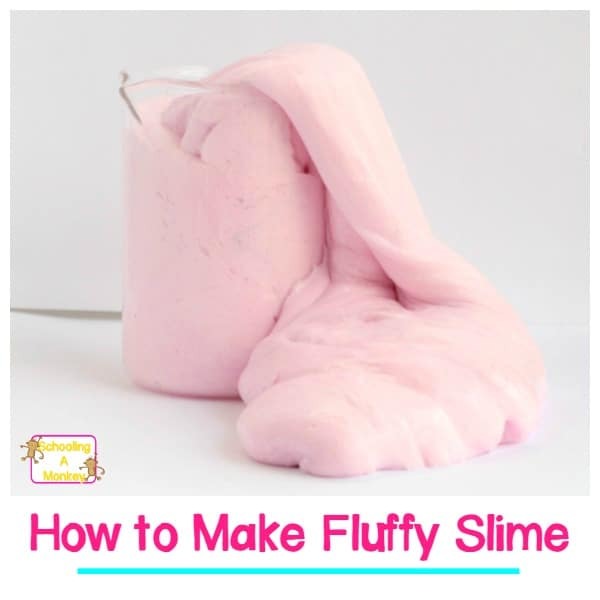 There are so many fun tweaks you can make to a basic slime recipe, like my kid’s favorite, fluffy slime! You can also follow along with our slime troubleshooting guide so you can ensure you’re not wasting your slime ingredients. You can store your slime in an airtight container for about three or four days. However, the slime will get a bit stickier during that time. You can usually revive it by adding a bit more activator. Remember that the longer you play with slime, the more it will mix. 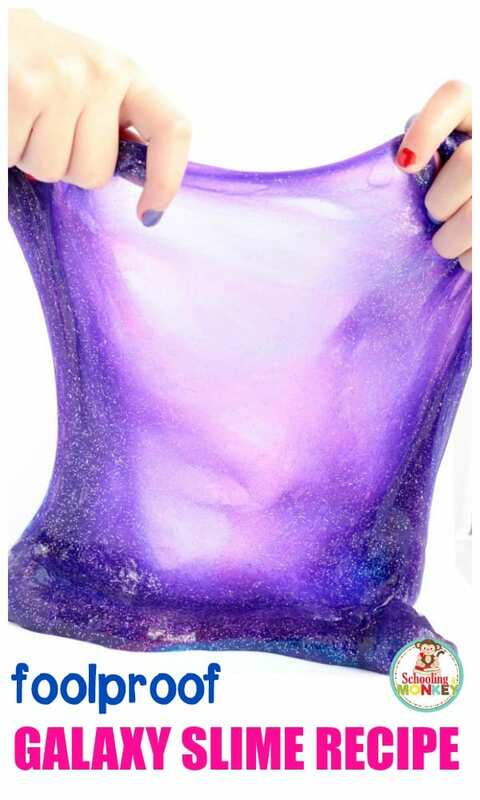 Eventually, your galaxy slime swirl will turn into one solid color of glittery purple. It’s a lot of fun, but not quite as space-themed. Follow these directions and you’ll have the best galaxy slime swirl ever! 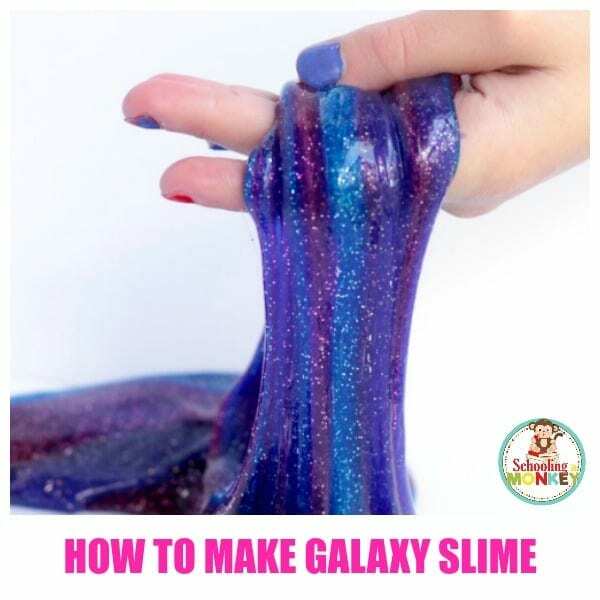 Follow these directly precisely, and you will learn how to make galaxy slime perfectly! Pay special attention to brands of food coloring, glue, and laundry starch. We can’t guarantee results with any other brands, and often, they just don’t work as well! 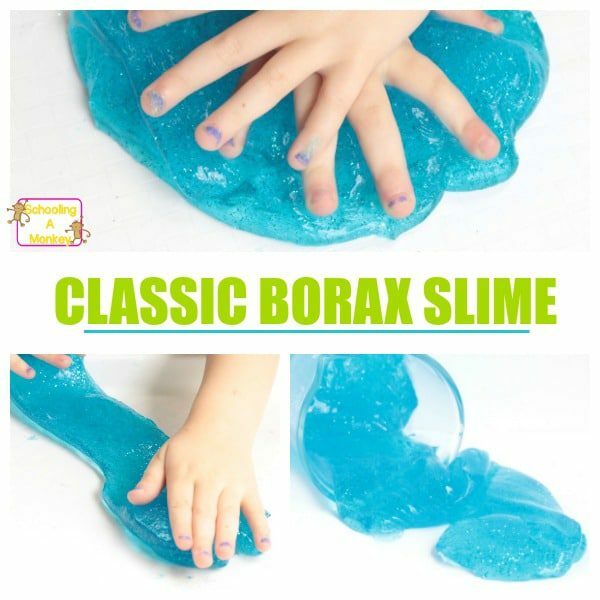 Please note that laundry starch does have extracts of Borax in it, so this is not a borax-free slime (if you’re looking for that, try this borax-free slime recipe). We always have good results when we mix one part glue, one part water, and one part laundry starch. If you want your slime to be slightly thicker, use a little less water, but I like how this ratio produces a true slime texture without being sticky or too runny. You’ll need three bowls for each color of your galaxy slime. 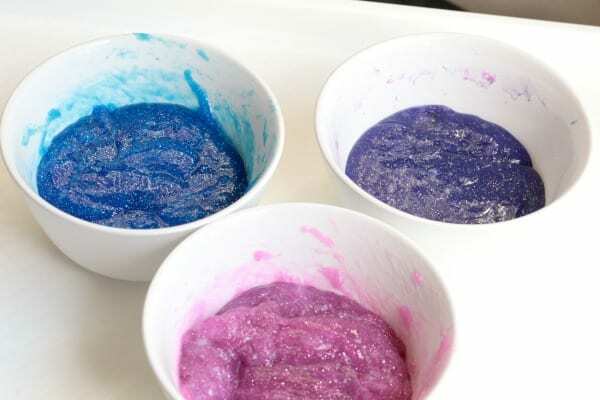 For our recipe, we added 1/2 a cup of glue, 1/2 a cup of water, purple glitter, and food coloring to each bowl. After stirring, add 1/2 a cup of laundry starch to each bowl and stir with a fork. At first, the slime will be sticky and look gross, but it’s not ruined. The slime takes a little while to fully form. If you think it’s too gooey, try letting it sit for about five minutes then come back to it. 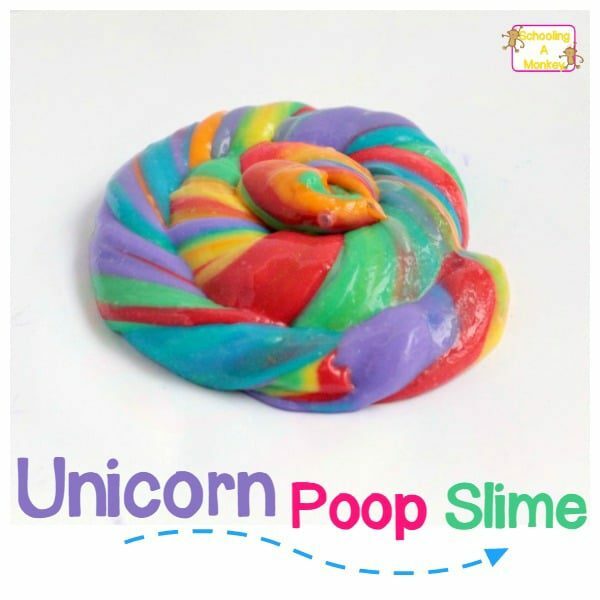 In most cases, stretching it and playing with it after the rest period will quickly transform it into the perfect slime. Think about it like building up gluten strands when making bread. Kneading it produces a better texture! 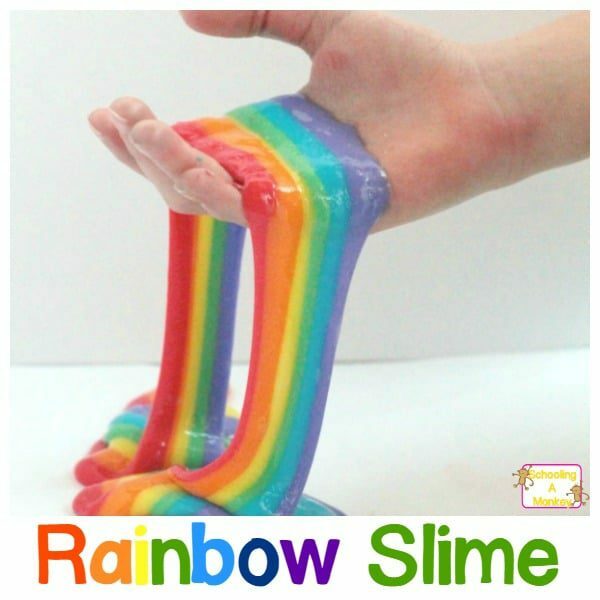 Once the three colors of slime are stretchy and no longer cloudy, it’s time to mix them. 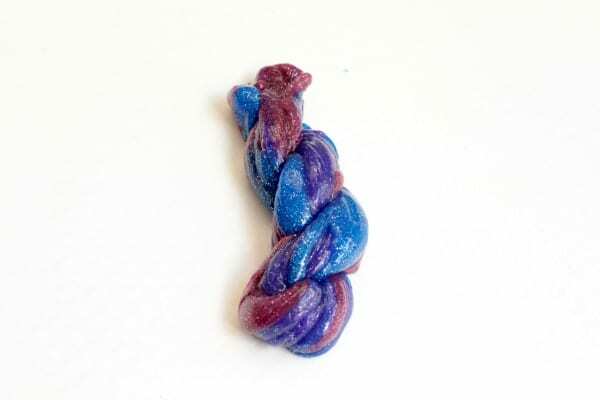 We sort of twisted and pulled them together to create a multi-color strand that had swirls and pockets of color like galaxy photos. 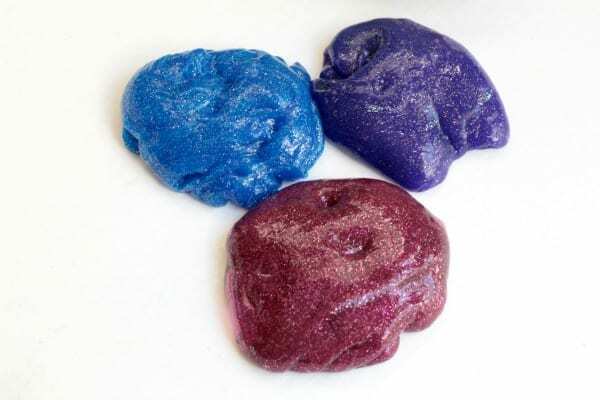 The more you play and stretch with the slime, the more galaxy like it will be, but after mixing completely, your slime will develop a solid purple color that is still cool, but looks a little less galaxy-like. So if you want to preserve the appearance of the galaxy, don’t over mix it. When it looks like this, it’s about perfect! We stretched our galaxy slime over a plastic snow globe and it looked amazing! 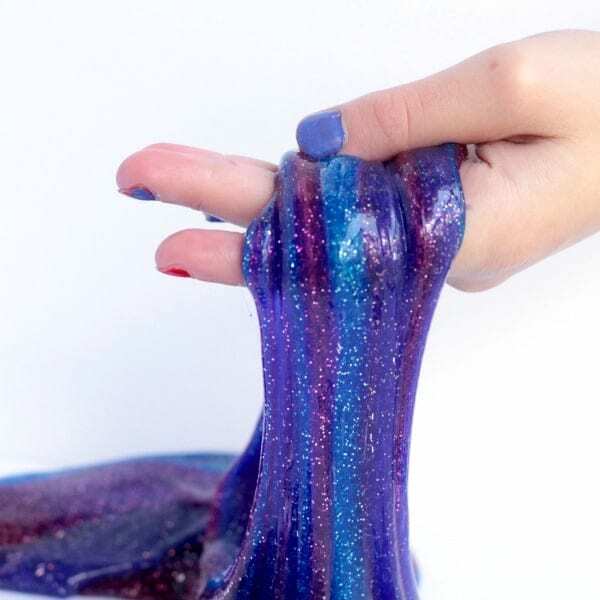 There are so many fun ways to play with galaxy slime! And now you know how to make galaxy slime!